From there I decided I would make the changes necessary to live up to my potential. I put together a team of passionate, committed individuals who I knew could help me reach my goals. Project Big to Little started with one goal, don’t die! Triathlon was the means to which I would reach this goal. I went to my local tri- shop for advice and help to get the tools necessary to reach my goal. I walked in and of course, the shop was full of these skinny guys who looked like they could ride the Tour, they never laughed at me, they helped me. I quickly started to notice I could keep my heart rate up in the right fat burning range but, I hated riding around cars so my rides were not as long as I needed them to be. I started asking how others trained, looking for a way to stay safe and still get the time needed to burn fat. 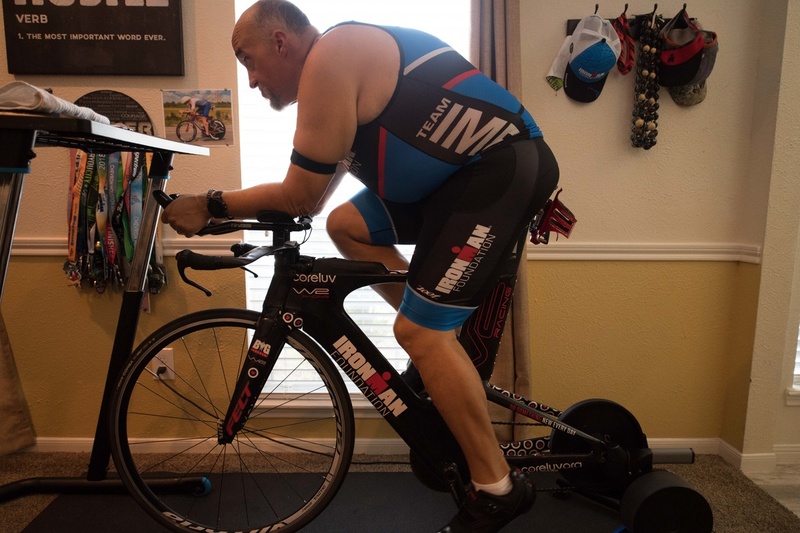 I bought a fluid trainer at first and then realized that I needed a power meter to really get the most out of my training, it was so difficult to maintain the wattage necessary for fat burning. I needed a trainer that would enable me to hold constant power and be reliable. The KICKR Indoor Smart Trainer came up as the standard for indoor training. I bought one and got on it right away. The KICKR was night and day compared to the fluid trainer I had been using. I was able to load my workout into a program like Zwift then let the trainer apply the resistance needed to make the most out of each workout. There was no escaping the work that needed to be put in, the KICKR was my reliable pain partner, never letting me settle or compromise. The workout was going to get done or it would show later. I noticed my power numbers were becoming more consistent. Later that year I would take part in Ironman Texas for the first race. I learned how to just sit on the trainer cranking out the watts for hours upon hours. I remember my longest ride on the KICKR was six hours. It is all a mind game for me. Why is it that a 20- minute warmup in Zone 1 goes by so fast and a 10 min yop of Zone 4 goes by in slow motion? It worked though, I became an Ironman later that year. The first two Ironmans I took part in I was training to complete them but if I wanted to go to the Ironman World Championships in Kona I would need to up my game and make the most of each and every workout. I began doing over-under intervals and tons of Zone 2 base building. I also took part in two-century rides where I was pleasantly surprised to see how far my performance had come in real-world scenarios. I have put in the work and reaped the rewards with an increase in my FTP by over 60 watts in the last two months. I stayed committed to my training by traveling with my KICKR everywhere I go. Those who follow me on social media always razz me about how I travel so heavy because I always have my KICKR in the back seat. I am heading to Kona early and taking my KICKR with me to continue my training leading up to the big day. That’s how I roll. When I first got the KICKR I tested all the third- party apps that pair to the unit and work so well but now I am all business and prefer to use my ELEMNT BOLT to manage my workouts. After Kona, I kinda have my sights on giving mountain biking a try. The Leadville race series looks like a challenge and may be my next big goal. I will continue to take part in at least one Ironman each year for the next few years and I’m thinking of taking part in an international race as well. 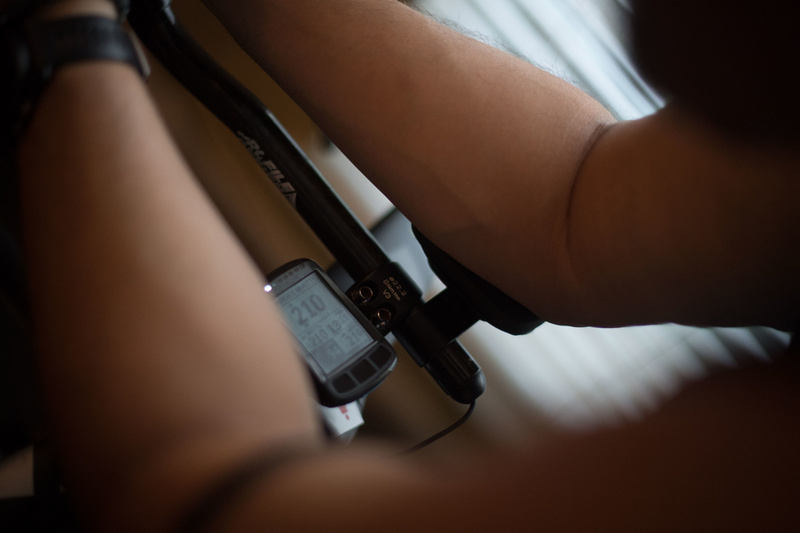 See out how the KICKR and our other Indoor Cycling products can set you on a course for personal best.